Aditya Ramabadran has learnt violin from Sri Susheela Narasimhan for the past 6 years and is now continuing to learn under the guidance of Smt Lakshmi Balasubramanya. Aditya is a 6th grader at Miller Middle School, San Jose, and enjoys Math and Computers in his free time. Yogitha is a 7th grader at Hopkins Junior High School, Fremont. She is currently learning carnatic vocal from Smt Nandini Ramamurthi and violin from Sri Vittal Ramamurthy. 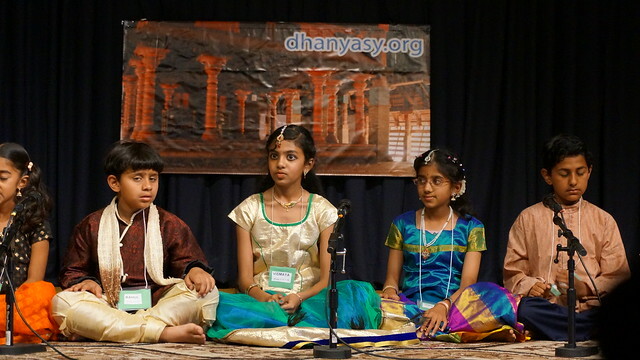 Yogitha performs in some of the local Bay Area events. Yogitha also learns Hindustani Music from Smt. Archana Tamhankar and Sri Manoj Tamhankar. In her free time, Yogitha enjoys reading. Gautham Viswanathan is a disciple of Sri Ramesh Srinivasan. He has participated in Tala Vadya programs conducted by Sarvalaghu Percussion Arts Center and in Cleveland Carnatic symphony programs. Gautham lives in Chennai, where he is an 8th Grade student at KFI. He enjoys science, video games, chess and basketball. 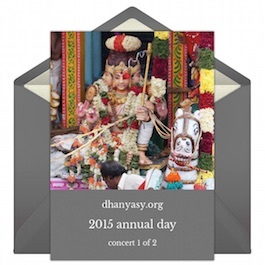 Sri Arun Anand Natarajan, a self-taught musician, is a resident of SF bay area. He started playing the keyboard from a very young age and has been driven by an interest to explore carnatic music with the western instrument. He has accompanied many young artists on stage, in carnatic music events. Click here for directions to Sanatana Dharma Kendra.